That's what Megan said after setting up the popup for the first time at River Rats. We talked about getting a pop up for a long time. All we wanted in one was a couple of beds and AC. After looking for about 5 months I finally found one. It is exactly what we wanted. Its a Coleman Taos 2001 model. It had a hand pump sick and stove but I took those out and we use that space as storage. We didn't want to get away from the outdoor part of camping but also wanted a break from the summer heat while we slept. Its just as easy to set it up as a tent. I'm sure we will use it alot. This weekend will its 4Th trip out this summer. I really enjoy it and I know Megan does. Well summer is starting to wind down. We have had a good one. 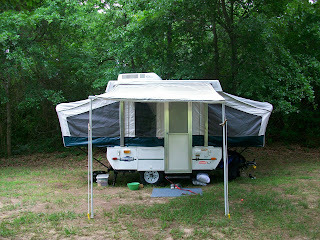 In June we went to Perdido Key Florida with our Friends K.&G.. We stayed in a house on the water way. I haven't been to Florida in several years and was really looking forward to it. It was better than I expected. Our house was fantastic. It belongs to K.s mom and dad. It is very cool,from the deck you have the Gulf to your left and the waterway to your right. We would sit in the mornings and watch the big boats go by. Right down the street there is a local bar and seafood place. I love places like that. The food was great topped off by cold beer. One of the things I loved about Perdido is it is not a tourist place. The nearest Walmart is a 20 minute drive. The highlight of this trip to me was the Naval Air museum. I will go back there when we return to Perdido. It was awesome. I will post pics as soon as I can. It really was cool. We missed the Blue Angles by one day. It was so cool seeing the planes from WWII that I have read so much about. If you are ever near Pecola' this is a must. Most days in Florida we just chilled. I did help K.s dad do some things around the house. We all spent a day working. We hung blinds. We didn't mind,we were still on vacation. After a week of seafood and great times Megan and I drove home. It was a really fun time. Over the next few days and weeks I will try to post more of a summer review. Crazy things in the mail..
Everyone gets junk mail,but today's visit to the mail box takes the cake. We got preapproved for 500 dollar credit on....SHOES!!!! We got this catalog that you can buy shoes on payment plans. That blows my mind. I could get a pair of Crocks for 3 payments or 13 bucks. I might send the magazine to Dave Ramsey. That is stupid to me. We sure have been lazy with the blogging lately,haven't we? The last few weeks of work are always a real mess. Megan is swamped everyday. I am non stop. I think I eat lunch most days standing up or take bites when I can. But in a few short days it will be SUMMER,for me anyway. I got this week and 2 days next week. Megan has to go an extra week. This summer I will work at the school as the maintenance man. Its a perfect summer job for me. I make my own hours and work mostly 3 days a week. We also have a couple of trips planned. We are going to the beach with some friends in June. I am actually looking forward to it. Its been about 10 years since I have been to the beach. Some time in July we are going to Pennsylvania with Megans dad. That will also be a blast. Its his 40th high school gradation reunion. I am sure alot of time will be spent at Ocoee river rats as well. The past couple of weekends I have gone to the Nantahala river. Last week Travis J. and Crista went. It was Crista's first time on a river. I must say she is going to be a great kayaker. I bet she will be on the Ocoee at the end of the season. I just got back from helping a freind of mine teach a class at the Nanty. We had a great time. the weather forcast called for 80% chance of rain and clouds all day. But they were totally wrong. We had clear skies and sun all day. the nantahala is such a fun river. I cant wait to get Crista back on. That will be this coming weeekend. I was going to paddle the Ocoee today but woke up to rain and a chill in the air. All i had to keep warm was my dry top so I came on home. Which is great because I took an hour and half nap. I guess I needed the sleep. Now that things will slow down I will be able to post more often. Our vegetable garden is doing just fine. We might have tomatoes soon. The flowers we planted are somewhat of a disappointment. It could be all the rain. But I am not complaining about that. Makes for great kayaking. The past couple of weeks has been busy. I am not going to complain about work on here but it has been rough. It always is this time of year. I want summer vacation as much as the kid do. I think we have got 4 weeks left. After a hard day at work I love to come home and work in the yard. We have been working just about everyday. As wet as it has been I think I have been mowing twice a week. We got our garden in the ground last week. I went and got a couple of truck loads of dirt from Martins here in Murfreesboro. We have a raised bed. I was going to put landscaping times around it until I remembered that those are pressure treated,so we just raised it without those. Hopefully I killed all the weeds around it. Anyways,we planted peppers,squash,,and cucumbers. I also planted tomatoes in the corner of the flower bed by the deck and some more plants in a container that I placed on the deck. This is our second year at trying a garden. Last years turned out OK so we doubled the size this year. This morning we got up and went back to Martins and got a bunch of flowers and filled my truck up with mulch. Its a tough job emptying the truck full of mulch. We put mulch in all our plant beds. Our hands turned black. It took lots of scrubbing to get them clean. Megan put flowers in 4 hanging baskets and all sorts of pretty things in the bed that borders the deck. I think my favorite will be the sunflowers. It should look great when everyting is in full growth. I will have Megan post pictures then. I dont know what we have planned for the rest of the weekend. Its a good thing we got all that done because we will be camping the first three weeks of May. Everyone go out and enjoy this wonderful weather. 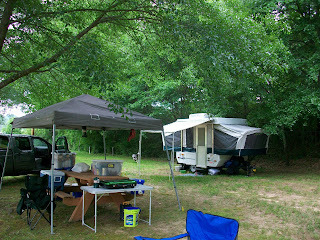 Last weekend we stayed at River Rats with Krista and Jay. They took a class Saturday so A few of went to the Ocoee. We heard it was running big. When we got there you could tell something was up. We drove up the hole river and decieded to get on at goforth creek. I have always heard about the ocoee at lots of flo but had never seen it much less paddled it. Our group did great we even had two 14 year old boys with us who one day will be great paddlers. Far better than their dads. Sunday we drove aropund M'boro the best we could to look at the damage. You see that stuff on TV and movies but that was my first time seeing something like that live. It was very humbling. My prayers go out to all who lost.